We employ a full time Activities co-ordinator who organises a different activity each afternoon. The activities range from bingo sessions, card games, dominoes, baking and gardening. She also takes different residents out for shopping trips on a rotational basis. There are trips arranged to garden centres, local parks and a local pub for lunch. Around Christmas time a visit to the pantomime is organised and thoroughly enjoyed by a lot of the residents. In the summer the residents are taken slightly further afield to the zoo etc. Relatives are most welcome to join their loved ones to any of the trips. We also have outside entertainers to come and entertain our residents. This can include a singer for a Sing-a-long, magic show or a comedy show. Summer Fairs, coffee mornings, Easter Bonnet competition and events to mark special occasions and special birthdays are also held at Ashdale. Residents and Relatives are involved in the planning and organising these events. Residents and Relatives are invited to join The Friends of Ashdale Committee. Any money raised at these events goes into the Residents’ leisure fund for their benefit. Clouds Clothing Ltd will be coming to Ashdale with a full range of Men's and Ladies clothing at affordable prices! During the summer months Ashdale will arrange a number of trips out to local attractions. The Ashdale 'Star Baker' staff baking competition and coffee/tea afternoon. £1.00 charge for Tea/Coffee and Cake. From 2:00pm to 4:00pm with Bake/Cake judging at 3:00pm by local celebrity. Home made cakes and bakes available for purchase after judging. All proceeds go to the Residents Comfort Fund. Note. Friends and Family only. We would like to thank you all so very much for the excellent loving attention Mam recevied whilst in your care. 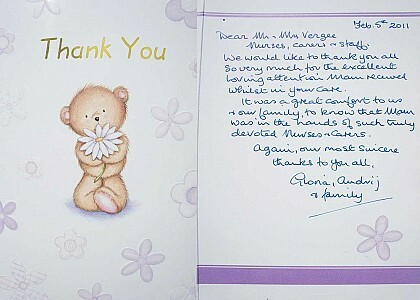 It was a great comfort to us and our family, to know that Mam was in the hands of such truly devoted nurses and carers. Again, our most sincere thanks to you all.